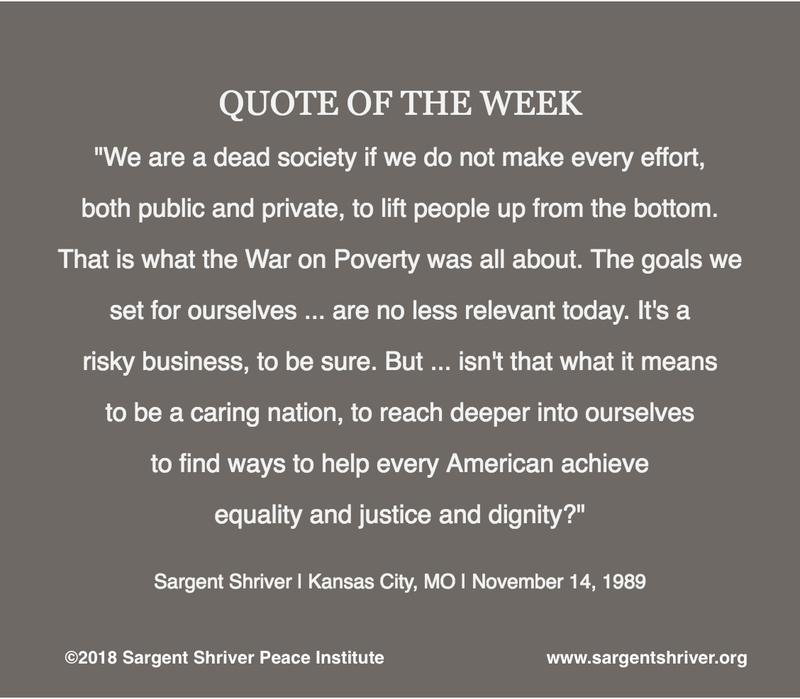 Sargent Shriver Peace Institute - "Equality and Justice and Dignity"
"Equality and Justice and Dignity"
Our Quote of the Week is the first in a series about poverty. As we prepare for Thanksgiving and think about the many things for which we are grateful, our thoughts also go to the millions of people who lack economic opportunity and who struggle without proper access to education, health care, justice, and all of the basic resources that we take for granted. We begin our series with some words that Sargent Shriver spoke in 1989 before the National Legal Aid and Defender Association. It is noteworthy that the speeches Sarge gave about poverty to legal professionals were often the toughest and the most frank, because he felt that attorneys like himself had a particular responsibility in creating a stable and equitable environment for all. Addressing the scourge of poverty was a key component in creating such an environment. In this particular speech, Sarge looks back to his time as the Director of the Office of Economic Opportunity (the office of the War on Poverty) and makes the point that things have not really changed in terms of what our priorities should be as a country. We should be able to ensure that all citizens are treated with dignity and can live life on their own terms in a just and equitable environment. Since we’re on the topic of law and justice, it’s important to remember that providing legal services for the poor was one of the key components of the War on Poverty. Sarge’s emphasis on poverty law was seen as controversial, but it proved to be important. At the time, it challenged the status quo and forced changes to the criminal justice system. Although many things have changed over the past five decades, the role of justice in the fight against poverty is as important as ever today. If you’re interested in learning more about how Sargent Shriver’s legacy lives on in the area of justice, check out the work of our friends at the Sargent Shriver National Center on Poverty Law. We’ll be exploring Sargent Shriver’s insights on poverty throughout the holiday season and into January, when we’ll mark the 55th anniversary of President Johnson’s launch of the War on Poverty on January 8, 2019. If there are particular issues related to poverty, past or present, that you’d like us to explore during these weeks, please let us know by emailing us at info@sargentshriver.org or by leaving us a comment below, on Facebook, or Twitter. In the meantime, we wish you a joyous Thanksgiving.